The Saskatchewan Roughriders have signed national safety Marc-Olivier Brouillette. Brouillette (6’1 – 220) is a veteran of seven CFL seasons after originally being selected by the Montreal Alouettes in the 3rd round (23rd overall) in the 2010 Draft. In 103 regular season games with the Al’s, Brouillette has picked up 202 defensive tackles, 30 special teams tackles, eight quarterback sacks and five interceptions. Last season, the 31-year-old Montreal native started all 18 regular season games for the Alouettes, totaling 34 defensive tackles, three special teams tackles and one interception. He was named a 2016 East Division All-Star at seasons end. The Saskatchewan Roughriders have signed international receiver/returner Chad Owens. Owens (5’7 – 180) spent last season with the Hamilton Tiger-Cats after signing with the team as a free agent in February, 2016. Through 12 games, the Hawaii native racked up 58 receptions for 808 yards and five touchdowns. He missed the final six games due to injury. Before joining the Tiger-Cats, Owens spent six seasons with the Toronto Argonauts where he was named the CFL’s most outstanding player in 2012 and the CFL’s most outstanding special teams player in 2010. He won his first career Grey Cup with the Argos in 2012. Through his career, Owens has registered 504 receptions for 5,982 yards and 25 touchdowns while adding 365 punt returns for 4,027 yards and six touchdowns. The Saskatchewan Roughriders have signed national running back Aaron Milton and national offensive lineman Ryan White. Milton (6’3 – 215) joins the Riders after spending the previous three seasons with the Edmonton Eskimos. The 24-year-old Ontario native was originally selected by the team in the 2nd round (15thoverall) in the 2014 CFL Draft. Milton has seen action in 14 regular season games through his first three seasons. He won his first Grey Cup with the Eskimos in 2015. White (6’4 – 290) signs with the Green and White ahead of his fourth CFL season. 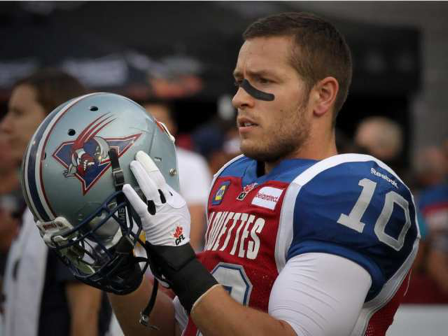 The 30-year-old Montreal native was originally selected by the Alouettes in the 6th round (44th overall) in the 2012 CFL Draft. The Bishop’s University product has spent time at guard and tackle through his 25 career regular season games. Brouillette is a great pickup. Chad Owens? Are you kidding me? Same height as Dressler with almost 3000 less receiving yards and only half the receiving TDs. He's also 3 years older than Dressler...what about the youth movement? The Riders are fairly deep at receiver so unless there's a deal in the works this doesn't make that much sense. Please don't trade Roosevelt! He broke out last year and is poised to be in the top 3 receivers in the league. Great guys but both players are not only at the end of their careers - their careers are done !!!!! Things are looking good for Kevin Glenn with oline being worked on and good bunch of receivers, now including Chad Owens. Felling better by the hour about letting Darian slip away. Unfortunately that is the only way to free up a lot of cash. Riders are owning Free Agency! Hope it all equates to wins next season! Loving the Canadian signings... and Chad Owens.. WOW wasn't even thinking he was an option. Now a QB to get the ball to our receivers would be nice. At least we know where Durant's money is going... free agent frenzy 2017! Mr. Jones, Mr. Murph rounding out a solid professional big league roster. More to come via training camps. Kudos to those two men for turning around a franchise top to bottom. The remanents of the last loser regime and bad decisions now being rectified. Can you feel the resurgence? Its on! Rider pride is coming back to Saskatchewan. Chad Owens is 34. Hope he has some gas left in the tank. Always loved Owens grit. tough dude. Riders loading up for a run at the Cup this year! Wow! I never saw this one coming. How can the Riders afford him? Chad Owens may still have gas in the tank as a returner like another elder, Stefan Logan. He does bring some great veteran leadership to a young Rider team's locker room. Wow did not even dream that Chad Owens would be a Rider. I hope he is not too old and works out. 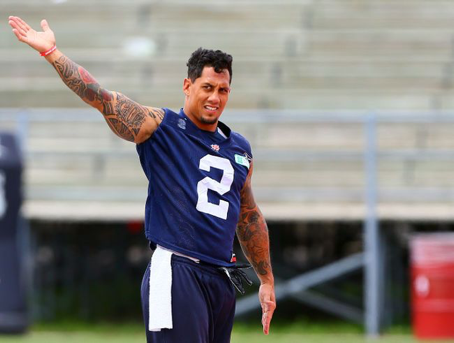 Chad Owens is being paid a lot, lot less than Weston Dressler. Chad Owens had over 800 yards in 12 games last year. He'll be fine and came at a bargain price. To Newt, I expect that that all CFL players work out. Even the older ones. Ugh. Kevin Glenn. So depressing. Is it a bargain if you only get 12 games out of him? Works out for the team and can contribute to Wins. Not as in physically work out. Who needs free agency when your team is already good and have good scouts...first two days of free agency you pay big bucks so what is down on paper better produce. It showed last year the riders do not know how to find many players so free agency is the only other way. Folks, Owens is coming as mostly a punt and kick return guy, not a steady receiver. He likely comes fairly cheap too and does have good hands to hold onto those punts and has some speed left in the tank if he is limited to kick and punt returns. Have faith, they have a plan. I think Riders still need a good def tackle, one more Olineman and someone at QB that WOWs us. Still have faith in getting Franklin. Glenn can be okay but will be way better if he is limited to a back up role. Don't forget with Owens I am sure Jones signed him with no money up front so there is 0 risk in this guy. Doesn't cost him a nickel unless he has spark and makes the team. You aren't getting Franklin...Toronto only has Willy and he will fail early on, I am betting Franklin gets traded there in the season unless he gets an extension. Sounds like all those FA camps across the line haven't yielded much. Oh well, that money is just gone it doesn't count against the cap. Great additions by the Riders these days! Looking forward to this season and Owens will provide some spark! Kudos to Jones and his crew. Quite a few signings but we had that last year and look where that got us. Most of them didn't even make it through a whole season. I'll temper my optimism until later in the season and we see that they have actually improved the team. At this point, it's time to walk the walk. No more year long training camp! He's going to return kicks. Franklin will be here sooner than anyone might think. Nobody will trade for him since he is a free agent next season and wouldn't sign an extension. No team will give players/drafts if they stand to lose him a years end. He will get traded to the Riders and the price won't be prohibitive. Edmonton will take a sensible return for him rather than try to hold out for more that nobody will give. He will be our QB sooner than later. Sorry to disagree with you on Franklin but Edmonton will not trade him for nothing and you can bet if a team like Toronto shows interest in having him then it's called allowing the team talk to him before the deal of trade is made...you can bet if he has a chance to start anywhere he will because his big picture is still making the NFL. According to some other sites, Chad Owens was given a two year contract for more than 110k per season plus bonuses. Also was given a substantial signing bonus. Apparently this is a sizable increase over what Hamilton paid him last year. Perhaps a bit much for a returner. Certainly not cheap. Way to go Jones more recycled players. Owens, how many games before injury? Also signing Montreal's mouthpiece and we know who that is. Kevin Glenn and on and on and on.Why are we paying Jones? I bet you said that last year too. I don't call 110k a year plus bonuses plus a signing bonus a bargain price for an old recycled returner. In all those camps down south, Jones can't find an exciting young returner with a future? It was reported that he got a substantial signing bonus.